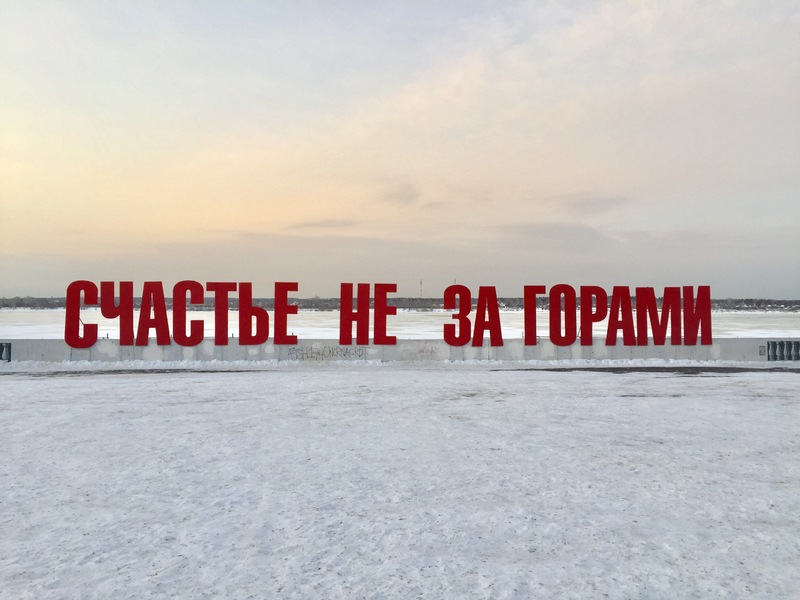 One of the best known landmarks in the Russian city of Perm is a modern art installation on the bank of the vast River Kama that consists of four Russian words built out of large red letters fixed to the embankment: Schastye ne za gorami. The literal meaning is “happiness is not beyond the mountains,” i.e., happiness is perhaps just around the corner. But in Perm, situated at the foot of the Ural Mountains, the phrase can also be interpreted in another way: that you don’t have to leave the region to find happiness. In a former space communications factory complex in an industrial part of the city, the creators of the Technopark Perm are putting all their efforts into making these words come true for the region’s talented tech entrepreneurs and convincing them to realise their potential at home. 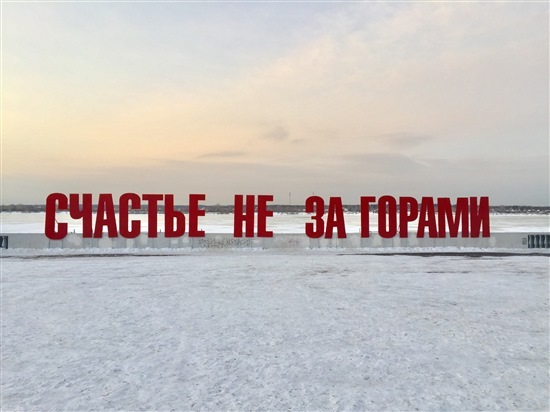 Artist Boris Matrosov's installation on the River Kama has become a local landmark in Perm. Photo: Sk.ru. When Vladimir Balandin, director of Technopark Perm, left his home city to work in Moscow, he noticed a disturbing trend. “I would often meet successful people in Moscow and discover we were both from Perm, and the question of why we had left would come up,” Balandin told Sk.ru in an interview on the sidelines of the Startup Tour in Perm, which took place at Technopark Perm last week. “It was very simple: we were successful in Moscow, we were fulfilling our potential, going further, while in Perm, it was not interesting: I didn’t feel support or inspiration, or find like-minded people – I don’t mean I couldn’t find teams to work with, but there was no evaluation from successful people around you, and that’s also important,” he said. Nor was there any interest back then from the regional authorities in halting the brain drain of specialists leaving for Moscow and other regions, according to Balandin, who has a background in banking and fintech, and previously developed innovative banking products for Sberbank in Perm, as well as service robotics for the banking industry. “The income per capital here is quite high, at least it used to be: among the top five regions in Russia. But the level of infrastructure didn’t match up, and that imbalance led to people beginning to leave the region, and that’s a shame,” he said. So when the idea came about to set up a technopark in Perm that would support small and medium-sized hi-tech innovative enterprises, Balandin moved back to his native city determined to change the situation. “The Perm region has plenty to offer, it has very strong educational institutions. Our task is to make those people stay here” - Vladimir Balandin, director of Technopark Perm. “We need to be a centre of gravity for the projects, startups, interesting ideas and innovators that Russia needs today more than ever before,” he told Sk.ru. Technopark Perm opened last year and is now home to 18 resident companies, comprising about 200 people working in innovative manufacturing, blockchain and fintech, telecoms, virtual reality, robotics and artificial intelligence. One of those residents is service robot-maker Promobot, which is also a resident startup of the Skolkovo Foundation. Technopark Perm provides its residents with office space, a co-working space, meeting rooms, a conference room and networking areas, as well as consulting services in accounting, legal contracts, intellectual property rights and other areas. “We always wanted this to be much more than a business centre,” said Balandin. Balandin and his colleagues interview each applicant company before they become resident. The startups must be innovative and able to create new jobs. “The Perm region has plenty to offer, it has very strong educational institutions. Our task is to make those people stay here,” he said. In preparing to open Technopark Perm, Balandin and his partners visited other technoparks across the country, including the Skolkovo Technopark, the biggest in Eastern Europe. They got to know the Skolkovo Technopark’s director, Renat Batyrov, attended Skolkovo’s Startup Village and Open Innovations forum, and went home determined to recreate what they had seen in Moscow at home. “The aim of my partners and I with this project is to create a Perm Skolkovo; Skolkovo is the main example for us,” says Balandin. 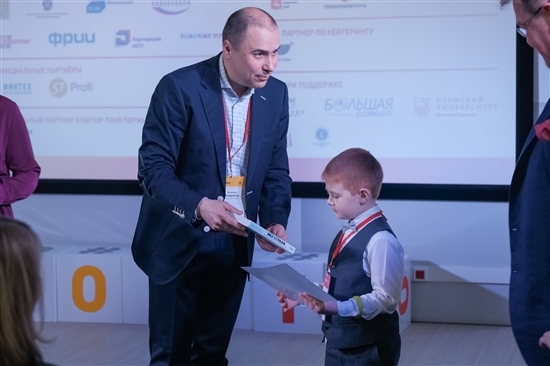 Technopark Perm director Vladimir Balandin awards a prize to the winner of the junior competition at the Skolkovo Foundation's Startup Tour in Perm on February 7. Photo: Sk.ru. There is one key difference between the projects, however. Unlike the state-backed Skolkovo Foundation and innovation centre, Technopark Perm is an entirely private venture. Balandin and his co-investors launched the project without counting on the authorities for money or resources, but would welcome their support in getting industrial enterprises involved in the tech ecosystem. “We’re trying to wake up the community of young startups, and what we need from the authorities is for them to shake up future clients, i.e. enterprises. We need to wake up business to show them that the projects being developed here – and we have seen this today [at the Startup Tour] – are more than viable and can really give companies an advantage, a real economic effect. The region is rich in industry, and now we need to make it as effective and competitive as it once was,” said Balandin. Technopark Perm was successful in winning the support of the regional government to hold the Startup Tour – the second time the city had hosted the event, the first being in 2014 – and now has its support in working toward its next goal: becoming a regional operator of the Skolkovo Foundation. Regional operator status entitles the resident startups of regional technoparks to access Skolkovo Foundation services such as mentor support and acceleration programmes, and help in introducing their product to major companies and in raising investment. Technopark Perm’s management is working closely with their counterparts at Skolkovo to reach an official agreement similar to those signed late last year with technoparks in the fellow Urals cities of Yekaterinburg and Chelyabinsk, both of which became official regional operators this month. A similar agreement with Technopark Perm will probably be signed in the second half of this year, said Yury Sibirsky, deputy head of the Skolkovo Foundation’s regional development department. "We’d like to turn this into a good franchise and give other regions the opportunity to build similar projects. We hadn’t dreamed of that a year ago, but we see demand on the market" - Balandin. “We are moving towards that,” he told Sk.ru, praising Technopark Perm as a private initiative. “We have been in close contact with them since its opening, and we like what they’re doing. “We’re impressed by the quality of their residents, their activities and events, and their initiatives: how they convinced the regional authorities to hold Startup Tour there: Perm wasn’t in the original list of cities for this year’s tour,” said Sibirsky. “It’s a good team, who see the technopark not just as a property, but as an ecosystem of small and medium hi-tech innovative businesses, just as we do here in Skolkovo,” he added. 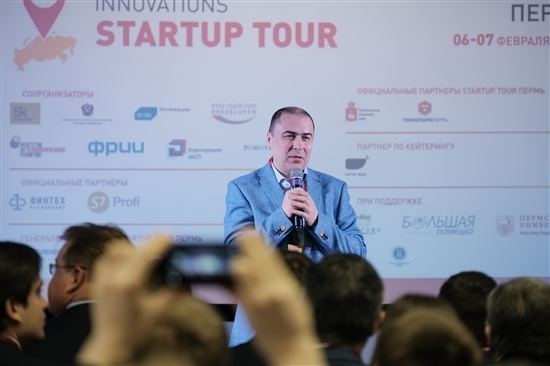 Balandin said he was grateful to the region’s new authorities for supporting Technopark Perm’s bid to host the Startup Tour, and says they have taken an interest in innovations. The regional governor, Maxim Reshetnikov, was elected last September, having been appointed acting governor six months earlier. A Perm native with a background in economics and programming, the 38-year-old governor said at the opening of the Startup Tour that his government was working on formulating and putting into practice extra support measures for the region’s IT specialists. Reshetnikov has said he supports the idea of Technopark Perm becoming a Skolkovo regional operator, “and has said the authorities would like to see several such technoparks appear in the region, for which the Technopark Perm will be the foundation,” said Balandin. Balandin and his team lobbied hard to bring the Startup Tour back to Perm, after it first visited the city in 2014. Photo: Sk.ru. The idea of replicating the Technopark Perm format in other locations also has strong grass roots support, according to Balandin, who said he had shared the concept at an event in Moscow for business representatives from the regions. “I was really surprised when immediately afterwards we received four requests from people to build similar things in other regions,” said the Perm businessman. There are also plans to develop the format within the Perm region. “There are people who come here and love the concept, but would prefer to work closer to home,” said Balandin. This led to the idea of organizing “technopoints” in the city’s suburbs: Technopark outposts that would allow people to access information and services from the Technopark – and visit it too if they need to – while allowing them to save time and manage their work closer to home.